Recombinant human soluble extracellular Flt-1 Ig-like loop 1 to 5 (sFlt-1(D5)). VEGF and its high-affinity binding receptors, the tyrosine kinases FLK1 and FLT1, are thought to be important for the development of embryonic vasculature. It has been shown that an alternately spliced form of FLT1 produces a soluble protein, termed sFLT1, which binds vascular endothelial growth factor with high affinity. Because sFLT1 has a higher affinity for VEGF than does FLK1, it may function as an inhibitor of VEGF response. Our Abpromise guarantee covers the use of ab9540 in the following tested applications. ELISA Use a concentration of 1 - 10 µg/ml. WB Use a concentration of 2 - 5 µg/ml. Receptor for VEGF, VEGFB and PGF. Has a tyrosine-protein kinase activity. The VEGF-kinase ligand/receptor signaling system plays a key role in vascular development and regulation of vascular permeability. Isoform SFlt1 may have an inhibitory role in angiogenesis. Mostly in normal lung, but also in placenta, liver, kidney, heart and brain tissues. Specifically expressed in most of the vascular endothelial cells, and also expressed in peripheral blood monocytes. Isoform sFlt1 is strongly expressed in placenta. Belongs to the protein kinase superfamily. Tyr protein kinase family. CSF-1/PDGF receptor subfamily. Immunohistochemistry (Formalin/PFA-fixed paraffin-embedded sections) - Anti-VEGF Receptor 1 antibody [Flt-1/EWC] (ab9540)Image from Matjila M et al., PLoS One. 2013;8(5):e63574. Fig 5.; doi: 10.1371/journal.pone.0063574. 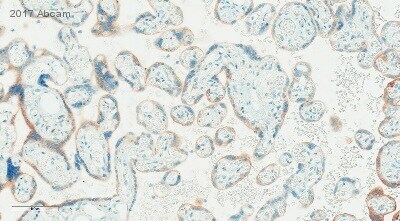 Immunohistochemistry analysis (Formalin/PFA-fixed paraffin-embedded sections) of Human Placenta, Placental Bed and Decidua Parietalis. VEGF Receptor 1 (geen) was labelled with ab9540 and VEGF Receptor 2 (red) was labelled with ab2349. Yellow - where both VEGF Receptor 1 and VEGF Receptor 2 are expressed. DAPI was used for nuclei staining (blue). Immunofluorecent staining of human VEGF Receptor 1 in a co-culture of PAE-VEGF Receptor 1, PAE-KDR, and PAE-FLT-4 using ab9540. Goat anti-mouse ALEXA Flour at 1/6000 dilution was used as the secondary antibody. Publishing research using ab9540? Please let us know so that we can cite the reference in this datasheet. Do you have more specific binding site of the antibody? the specified area is large (D1-5). The binding epitope is located in ecto domain D1 or D2. I wonder if the antibody recognize only receptors without the ligands (VEGF or PLGF) or both- with or with out ligand. The epitope is in the ligand linking area. We do not know if the antibody recognizes the receptor when bound with its ligand. We can confirm that the antibody recognizes the receptor unbound as the antibody will detect denaturated human VEGFR-1/ Flt-1 in ELISA experiments. does ab9540 recognize both the soluble form and the membrane one of the VEGF (Flt-1)? Is there a protocol to use this ab to immunoprecipitate the soluble form of Flt-1? We would like to confirm that this antibody recognizes both forms. IP is a normal standard protocol: 1-2µg antibody, 30µl anti-mouse IgG activated Sepharose beads (Sigma), incubation for 3-4 hours on a rotating dish or over night at 4°C. Centrifugation for 5min at 2.500rpm, aspire the supernatant and wash 3 times with TBST buffer. Reconstitute the beads in 2X SDS sample buffer or in other buffer you like. Yes, the soluble Flt-1(D1-5) was used for the immunization. This antibody recognizes very well the native soluble Flt-1 from e.g conditioned medium of HUVECs. What should I use for the positive control with western blotting? You placed an image with recombinant soluble VEGFR-1 on your datasheet. Is it commercial, or could you give me any advice, for example, some cell lines? Thank you. Any commercial recombinant solube sVEGFR-1 will work (e.g. from RELIATech or R&D Systems). You can also use 5-10 ml CM from HUVEC and concentrate it by heparin affinity in order to get a nice band in Western blot.